This article by Kevin Zeese and Dr. Margaret Flowers is re-posted from CounterPunch. The old environmental movement,‘Gang Green,’ works inside the existing power structure, takes funding directly from polluting corporations and foundations funded by polluters, sometimes gets a seat at the table which ends up helping to pass inadequate regulation that becomes a license to pollute, while giving the law legitimacy. Some ‘Gang Green’ members show signs of realizing they are on the wrong path and need to re-make themselves to face the urgent ecological crisis of widespread toxins, species extinction, water and air pollution, soil depletion and climate change. The ‘New Green’, often groups led by a new generation that realizes the extraction economy that allows us to continue the American way of life (AWOL) cannot continue. They see the ecological crisis caused by the carbon-nuclear based economy worsening with the “all of the above” strategy of President Obama and the corporate duopoly parties. The dangerous approaches to energy extraction including off shore drilling, mountain top removal, tar sands, hydraulic fracking and uranium mining (as well as the dangers and waste products these produce) are evidence that the human species needs to move quickly to a carbon-free nuclear free energy economy. There is a growing culture of resistance in the environment movement as Rising Tide of North America reports. 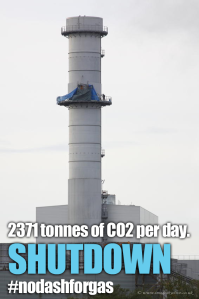 Last week the Guardian published an amazing video of the group “No Dash for Gas” in the UK occupying a gas power plant. The video showed the preparation they went through: training, intelligence gathering, practice; and then the meticulous execution of a very difficult occupation of two 300 foot chimneys of a massive gas plant. They occupied the plant for 8 days. In a few days the video was removed from the Guardian website “pending an investigation.” At about the same time the power company, EDF, sued the activists for £5 ($7.53) million in damages. No Dash for Gas is reporting a backlash against the company and support for their cause. They point out the damages amount to .3% of the company’s profits and that within 48 hours 10,000 people signed their petition. The group makes a strong case for “disaster gas” which will bring the world closer to the climate tipping point. In fact, we found in researching an article on hydraulic fracking, that one of the things the oil and gas companies do not want us to know is that methane, a key part of gas, leaks into the atmosphere in the fracking process. Methane is a more potent greenhouse gas than carbon dioxide by a factor of 30 to hundreds. The anti-fracking movement in the US is growing and combative. Hundreds of thousands wrote to stop Governor Cuomo’s march toward widespread fracking and successfully stopped fracking pending research. And, More than 6,000 New Yorkers have already signed a pledge to commit acts of nonviolent civil resistance if Cuomo permits fracking. Americans Against Fracking reports more than 250 communities are taking action against fracking. Three were arrested last week in Pennsylvania blocking trees from being cut. 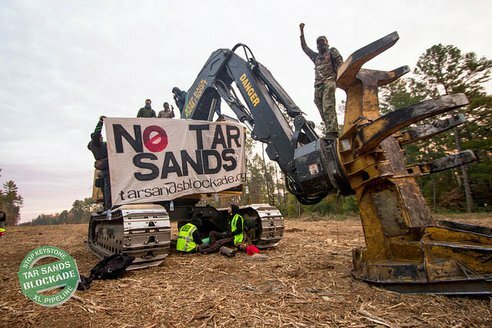 We have been consistently reporting on the direct action against the Tar Sands pipeline, the Keystone XL, since last August. 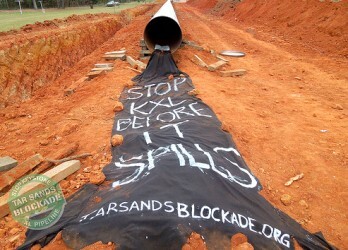 The actions of the Tar Sands Blockade inspired people from Occupy Washington, DC at Freedom Plaza who have joined their actions. We urge you to support their upcoming national days of action March 16 to the 23. Now the blockaders are moving north to Oklahoma where they will have a training March 17 to 22rd. We were pleased to see the Tar Sands Blockade link with Appalachia Rising to stop the operation of a hydro-fracking storage facility in Ohio. This is an important part of the ‘New Greens’ thinking – all issues are connected as we have a common enemy in corporate power that dominates government in the big finance capitalism of the United States. Groups like Mountain Justice and RAMPS which focus on mountain top removal for coal, are now taking on fracking as well. Of course, both destroy the environment they live in. Mountain Justice is currently holding a spring break training until the 10th. Other groups like RAMPS (Radical Action for Mountain Peoples Surival) have escalated tactics against coal companies and worked with native Indians, vets, community residents and others against big coal..
We’ve also reported on the inspiring Idle No More movement since its inception and continue to do so. Last week native US Indians were occupying an area in Minnesota to block a pipeline going over their land. A lot of these groups have fun with their protests like many of the spectacle actions of the Backbone Campaign. We enjoyed this one from the UK, protesting at a pro-fracking politicians office, putting up signs labeling him a fracking company and putting up a fracking site on the Green in front of his office. And this one from Flush The TPP, blocking their global corporate coup negotiation in Virginia. We hope Michael Brune brings a new direction to the Sierra Club, more aggressive challenges to the power structure, participation in direct action and no more corporate money. These groups ally with the Democratic Party, a party that is deep in the pockets of the carbon and nuclear industries. Last week coal giant Duke Energy turned a $10 million loan for the Democratic Convention into a donation – for a convention Obama promised would take no corporate money. Then there is the nuclear industry, Sunlight Foundation reported on an Atlanta utility that hopes to get $8.3 billion in nuclear loan guarantee which miraculously is coming closer to reality after a $100,000 donation to Obama’s inauguration. Hopefully, the recent Draft Environmental Impact Statement will wake up ‘Gang Green’ to the truth that Obama and the Democrats are the other Wall Street party and not allies of the movement for a carbon-free, nuclear-free energy economy; and that we have to confront pollution profiteers not work with them. One of the characteristics of the ‘New Greens’ is they are welcoming. They look for the best, even in members of ‘Gang Green.’ We hope their instincts are right and the traditional environmental movement will re-make itself into the combative advocates the country needs. This is not the time for compromise. It is not a time to be restricted by foundations or for partnerships with corporate polluters and the Democratic Party. The stakes are too high. The health of the planet is at serious risk from extreme corporate capitalism’s voracious appetite. It is time to cut off the gang green and start new.